The Forty-Niners put San Francisco on the map and explored north into much of California and the Oregon Territory. Most of them didn't strike it rich. Instead they left their mark in the form of claims, place names, settlements—and in some cases environmental degradation that is still with us today. Life was hard for a gold miner. You had to have your wits about you to survive. One of the many dangers was scurvy, caused by a deficiency of vitamin c. But the smart miner knew there was more than gold in them thar hills. There was green, too—a humble green (recently re-classified in the Claytonia genus) that grew in thick mats, was available much of the year, and packed the necessary nutrients a prospector needed to live in the bush. Hello miner's lettuce. Also called spring beauty, winter purslane, or Indian lettuce, Claytonia perfoliata, native to the western U.S., with particular abundance in the Pacific Northwest, is the best known species of miner's lettuce. As one of the first spring greens to emerge, it's a valuable edible just when it's needed most. Pictures typically show Claytonia perfoliata with a round leaf from which a flower stalk emerges in the center. Early in the season, however, the leaves are more apt to be spade-shaped. They're tender and succulent, reminiscent of spinach yet with a wild flavor that isn't overpowering. While I usually find my supply of miner's lettuce when I'm hiking in the Cascades or Olympics, there are also patches right inside the Seattle city limits. I picked this bunch today in a park near Lake Washington and used it in place of spinach in a classic early spring salad with beets, goat cheese, roasted walnuts, and a simple vinaigrette. Miner's lettuce also has the distinction of being one of the few green foods, along with Stinging Nettle Soup, that my finicky, vegetable-averse boy will eat. 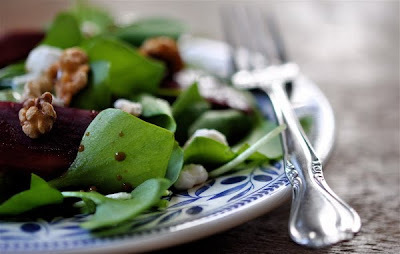 If you haven't eaten miner's lettuce before, try a few leaves added to your usual salad. Soon you'll be chucking the domestic greens altogether in favor of this wild treat. I'd love to have you enter this post on foraged Miner's Lettuce into this month's Grow Your Own roundup! what a delectable looking green. Saw morels at the market Sunday, you heading up for them soon? I totally love miners lettuce, however I have never gone out and foraged for me own, rather rely on the lovely folks at farmers markets. Just mixed in to a simple salad it is lovely too, perhaps with a little frisee for texture. Great post mate. Love the little video there. Great stuff, and appearing more frequently in our urban settings here in California, too. I love that it's never bitter! I've been picking a bit when I go out the Grange Hall for the weekly Square & Round dance classes - there's a lovely mass growing under the OLD Doug Firs, & even some in the little garden in front of the Grange! I keep thinking I'll bring a bit home & see if I can find a place it's happy in my yard! This is one of my favorite wild greens. Several years back I found seeds for it in a gardening catalog and got them to add to my winter shoulder and winter season plantings in the p-patch I had at the time. It was such a faithful grower and it just kept reseeding itself. I'm wanting to get seeds again for my new p-patch to have on top of what I find out on walks and hikes. The first time I saw this in a fancy grocery store, I chuckled. We're growing Claytonia for the first time, and it is so odd-looking that I had to double check to make sure weeds hadn't taken over the row of greens. We haven't done much with it yet, so I was really happy to see your post. Time to harvest and eat these before the heat wipes them out here in Houston. Russell - I'm guessing those morels came from California or maybe even Georgia. But we'll be into 'em soon. r. hurd - Purty, I reckon. Matt - We need to get you into a wild patch, mate. Josh - Really? Have you seen an increase in urban miner's lettuce? That would be cool. Dia - I heard good reports of seeding miner's lettuce in the home garden. Go for it! Maurie - Now you've got me thinking about my local p-patch. It's a great source for weeds and would be even better with a native green. Vegetable Matter - The leaves change shape through the season as the plant grows. Don't mis out on those tender early leaves (though it's just as good when the flower stalk forms). The Foraged and Found guy told me that they were local landscape morels, but that they were selling California ones to restaurants. I think maybe that worries me a little? I thinkmost of what we have in W WA lowlands is Claytonia (Montia) sibirica, which stays more lanceolate/egg-shaped. I've seen C. perfoliata, but normally more in CA and OR, only occasionally hereabouts. It's still tastes great, with dandelion greens as mentioned, a little early sheep sorrel, and some salmonberry shoots. AndrewM - Yeah, I find lots of C. sibirica in the Cascade foothills too. The young specimens tend to be even more lanceolate than C. perfoliata and have a more succulent look. The patch shown is C. perfoliata; some of the leaves in another nearby patch were starting to develop the characteristic round leaves, but it's still early. On the eastern slopes of the Cascades I see a fair amount C. perfoliata, and down in OR & CA as you mention. have you tried the siberian miners lettuce? Ive found that siberian patches around the sound outnumber the round leaf 10 to 1. Anyway; the siberian always gives me a slightly sore throat but the round leaf doesnt. Any idea if this would be growing up in Whatcom County? I just picked some fiddle heads up here and I'm thinking to find some miner's lettuce as a nice side. At this time of the year, I can't *not* find miners lettuce of whichever species. It prefers more open deciduous forest, along paths, partly to mostly shady, pretty much everywhere except more salty/coastal, deep woods, or open meadows. You can also buy seeds for growing it, or maybe sneak a few plants from the woods. And it reseeds itself... generously. I live in Dunedin, in the south of New Zealand. I had thought the outbreak of 'plants' were a weed until today. A stall at the Farmers Market had some 'Miner's Lettuce' for sale and explained how to use this as a vegetable. I will no longer be pulling it out of my garden but rather encouraging it to grow so that we can eat it! I am completely in love with miners lettuce, but I went out and foraged own I never have, and instead rely on the farmers market in the lovely folks. 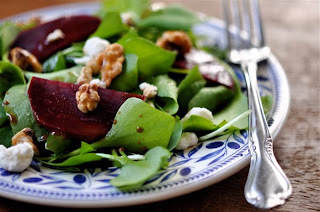 It is designed to mix with a little frisee salad is a simple one is probably the most beautiful. Great post mate. Love a bit of video.